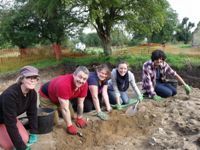 Woking Palace was first excavated in the early 20th century, but more recently hundreds of community volunteers joined Surrey County Archaeological Unit between 2009 and 2015 to excavate the site. Lying 0.8km east of Old Woking, the exceptionally large (over three hectares) moated site at Woking Palace was the manor house of Woking from at least 1272. During the next two hundred years it was often occupied by those close to the throne, most notably Lady Margaret Beaufort (the mother of Henry VII) who lived there with her third husband. In 1503 its status was further enhanced when Henry VII decided to develop the property as a Palace, and this work continued under the later Tudors. The Palace fell into disrepair after 1620 and was mostly demolished. Nevertheless its remains are exceptionally interesting and include well-preserved moats, ruined and standing structures, and fishponds. The site is owned by Woking Borough Council and is currently accessible to the public on a restricted basis. It forms a heritage resource of immense potential for the local community but one that is presently under-used and under-appreciated. The community project originated in July 2009 with topographical, resistivity, magnetometry and ground penetrating radar surveys carried out. The survey results have provided a lot of information about the buried remains, and show the general layout of the wall foundations and other features. Following on from this work and a number of excavations, the project was awarded a grant from the Heritage Lottery Fund in 2013, ensuring further work could be carried out. The project was been jointly organised by the Friends of Woking Palace, Surrey County Archaeological Unit (part of Surrey Council) and Surrey Archaeological Society, with the generous support of Woking Borough Council, Archaeology South-East (University College, London), and QUEST (Quaternary Scientific, University of Reading). During each year of excavation, a different area of the site was unearthed to give an overall view of how the site developed over time. From 1199 to 1485 the manor of Woking passed in and out of royal hands. The site was surrounded by Woking Park, created for hunting, and first mentioned in 1236, though it may be older. A survey of 1326 records that the establishment consisted of 'a capital messuage, surrounded with moats, containing a hall, chapel, two chambers … a kitchen, larder, bakehouse, brewhouse, poultry house, laundry', together with lodgings for the household, and associated gardens, stables and farmyard. In 1485 Woking manor was restored to Lady Margaret Beaufort, mother of Henry VII, who resided at Woking Palace. She appears to have spent most of her time at the Palace. The most substantial above-ground survival, the stone building, probably belongs to her residence, as do the splendid floor tiles from Valencia, Spain. The manor became Crown property once more in 1503 when Henry VII began its development as a palace. The most important of the structures that he built was a new great hall, under construction in 1508. The great hall was still incomplete when the palace came into the possession of Henry VIII on the death of his father in 1509. Henry regarded Woking Palace as a favourite residence in the earlier part of his reign, and stayed there for some weeks almost every summer hunting in Woking Park. Henry made major alterations and improvements to the Palace. Mary I and Elizabeth I stayed less frequently at Woking Palace and by the end of the 16th century it was falling into decay as a result of long years of neglect. In 1620 James I sold the manor and lordship to Sir Edward Zouch who demolished it and used the materials to construct the original Hoe Place, Woking Park Farm, and most probably other buildings in the area. 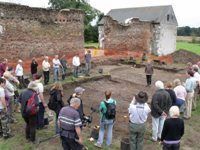 In 2018 the Friends of Woking Palace and SCAU were thrilled to find that The Woking Palace and its Park Project had won the 2018 Council For British Archaeology Marsh Award for Best Community Archaeology Project. The project included 3 years of excavations at the site of Woking Palace, as well as school visits, talks, the publication of popular booklets and academic reports, and research forums. 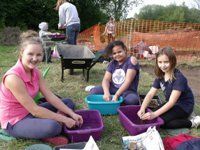 Over 1,800 volunteers of all ages were involved with the excavations, leading the March Award judges to comment that 'your work on the project and the way you have involved the whole of the local community is exceptional and was recognised by the judging panel as outstanding'. To view some of the artefacts found during these excavations and to learn more about Woking Palace, why not visit The Lightbox in Woking to see the permanent exhibition in the Woking Story Gallery. A popular booklet and the full report with more details about the site and the archaeology are both available from our bookshop. To organise a tour, find out about upcoming open days and for further details go to the Friends of Woking Palace website.